The people who occupy the territory known as Abiriba descended from the Igbo and Efik people of Calabar. They migrated from the upper Cross River area centuries ago led by a Nnachi Oken, from whom the title "Enachioken" ("The Monarch") originates. Initially, they occupied a smaller territory which expanded when the Abiriba people routed the surrounding Nkporo people and took over their lands. The Abiriba people were war-like and quickly established themselves in the area. The origin of the Abiriba people is not as speculative as the origin of other Igbos of southeastern Nigeria. 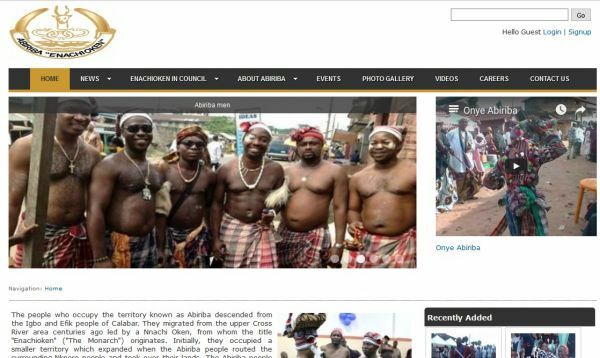 Historical evidence supports the fact that Abiriba people have common ancestor with the Yakor tribe of Ekoi of cross river basin and the people of Arochukwu. At Ekoi, constant disputes between the seven families under Ukpaghiri prompted the clan to move to Ena and finally to Akpa. A content management based system was developed.